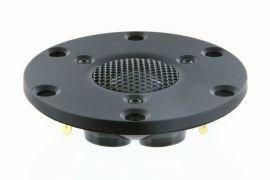 1" dome tweeter with Beryllium Diaphragm. "Top of the range" tweeter with pure beryllium diaphragm, large roll surround and AirCirc motor system provides an excellent - unsurpassed - sound reproduction with a flat frequency response to above 40KHz, outstanding off-axis response, low distortion and dynamic precision. Scan-Speak D3004/664000 tweeter features also AirCirc Magnet System and black rubber pained aluminium faceplate.